to quality and taste reminiscent of a simpler time when craftsmanship was king. Beer that is easy to drink and hard to put down. The CLB Tap Room is the perfect place to find your favorite beer. 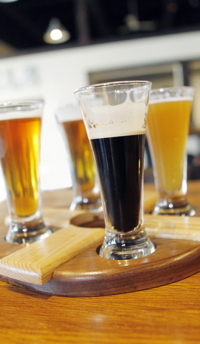 We always have 8 to 12 different offerings on tap, available in pints or taster flights (4 beers, each in a 4 oz pour). Bring your own food to pair with our delicious, locally made beers! Staying home or headed to a party? Growlers are 64 oz glass jugs filled with fresh craft beer right from the tap, and are perfect for the back porch or gatherings with family and friends. Available in the tap room during regular tap room hours. CLB beers are available at hundreds of better bars, restaurants and retailers across northern Illinois. 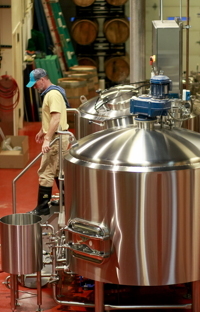 Family-owned, with roots in the community, we take pride in the fact that we brew and package our products right here in downtown Crystal Lake. But donʼt try us just because weʼre brewed right in your backyard. Instead, try a CLB because weʼre committed to brewing world-class beer. Beer created with the attention to quality and taste reminiscent of a simpler time when craftsmanship mattered. There’s a buzz in the air. An anticipation that builds with each passing day as robins reappear, daffodils bloom, and the lake ice goes out and the piers go in. And no one is more excited for the equinox than the folks in Crystal Lake. Another sign of spring is our seasonal release Spring Fever, a Raspberry Hibiscus Ale that is both tart and tasty, refreshing and delicious. Malt, hops, raspberries and hibiscus flowers are combined to create an easy drinking, fruity beer that celebrates the new season. Consider Spring sprung. Reel Juicy is an explosion of hoppy goodness! Huge tropical fruit notes erupt from the pint. The beer has a definite haze due in large part to the outrageous amount of hops we put into it. The flavors range from pineapple, mango and guava to candied orange and kiwi. The body is smooth with only a slight bitterness allowing the almost creamy mouth feel to caress your palate. If you love hops and the alcohol of an IPA, but aren’t a fan of intensely bitter beers, then this beer is for you!